Kentucky Archaeological Survey (KAS) public education efforts include the KAS Educational Series, booklets designed to make information about the results of prehistoric and historic archaeological research carried out in Kentucky more widely available to Kentucky’s citizens. The KAS Video Series includes two short documentaries produced by the Heritage Council that blend interviews, rare archival images, artifacts and highlights from examining Native American sites in Kentucky. Since 1983, KAS staff have also coordinated an annual archaeology conference, and from these have published research geared to professional archaeologists to highlight current research and exploration of Kentucky’s archaeological resources. 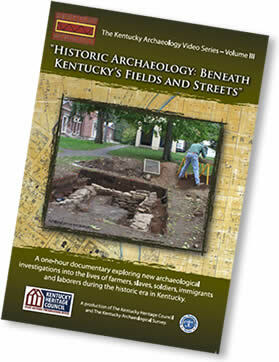 Presented in a series of professional publications, these papers cover a broad range of topics relating to Kentucky archaeology. More information about any of these is available by contacting Yvonne Sherrick, Site Protection Program Assistant, at 502-564-7005, ext. 112.